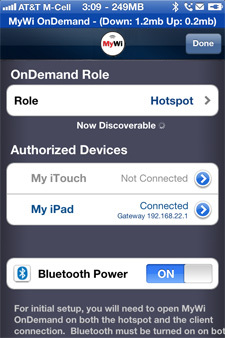 Create an iPad® to iPhone® connection On Demand! Having to turn on and off a hotspot gets old quickly when you're doing it all the time, as when you share your iPhone's 3G connection with a WiFi-Only iPad. Instead, MyWi OnDemand connects when you need it, and disconnects when you don't. When you leave your WiFi connection at home and you're using the iPad, the iPad will connect automatically. When you turn your iPad screen off, or go back where you have WiFi, MyWi OnDemand will disconnect. After a simple pairing, everything works automatically! Will work with 3G/3GS/4 iPhones/iPod Touches (3.1.2+) and iPad (3.2+). Requires purchase of MyWi 6.0. Hotspot controls who is able to connect and may "kick" any devices at will. 3-Day Free Trial via Jailbreak your iPhone and install via Cydia! Easy iPad to iPhone Internet Sharing! 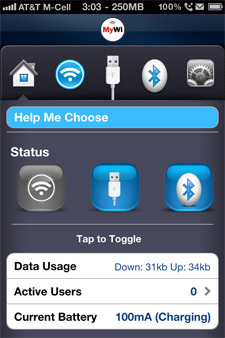 Share your internet connection from your iPhone to another iDevice simply! Once setup - there's nothing more to do! 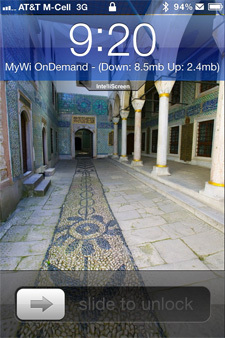 Setup is Simple Setup MyWi OnDemand on the Hotspot and the Client (ie, iPhone and WiFi-Only iPad). MyWi OnDemand connects when the iPad screen is off or WiFi isn't present and disconnects when you have WiFi - automatically! Set it and forget it! 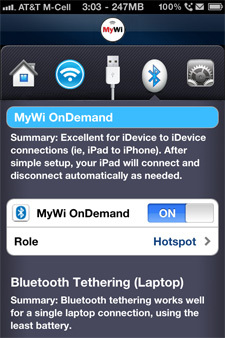 Supports Multiple Hotspots If you have more than one iDevice acting as a Hotspot, MyWi OnDemand can find one of the Hotspots in range to connect to. Nothing to Turn On Once paired, the Client iPad will autoconnect to the iPhone, even when it's in your pocket. There's nothing needed to do!